Q: I've been flying my airplane for 30 years, and I've never had a problem with the flaps... why do I need this ? A: Well... Nobody had a problem with paper sectional charts - until GPS came along. The very first time you use EZ Flap, you'll immediately realize it's a lot better than reaching down to the floor for the flap handle ! Q: But I can already reach the manual flap lever ... why do I need this ? A: If we strapped you in the back seat of your airplane, you probably can figure out a way to lean forward and fly the airplane if you had to. But why fly like that? Having the controls at the correct distance sure would make it safer, easier, and more enjoyable! Q: I have an "inertia reel" type shoulder harness that allows me to bend forward and reach the flap lever... why would I still need this ? A: Just because your inertia reel allows you to bend forward, lean into the instrument panel, take your focus off your landing zone or traffic, and possibly even bump into the control yoke with your chest..... doesn't mean you should be doing that just to reach the flaps. There is no reason to fly that way anymore. at the most correct, comfortable, safe location. or inertia reel you do or don't have. Q: I'm a 7 foot tall basketball player with long arms - why do I need this? A: Click on "Tall Pilot ???" on the left side menu... if you dare ! Q: Can’t you make it shorter / smaller / closer to the seat? A: No, we tried that and it doesn’t work. A half-size prototype was installed close to the seat and test flown. Not even King Kong could deploy the flaps past 10 degrees. It needs to be mounted near the front of the flap handle for you to have enough leverage. Q: Is there any restriction in airspeeds or operation of the flaps with EZ Flap? A: No, there are no changes to the flap speeds or how you operate the flaps. Q: How long will it take to install this thing… can I do it myself? A: It takes me less than 30 minutes, and will take any reasonably proficient and confident mechanic less than an hour to install, and most of that time is reading the instructions (The instructions are intentionally very detailed for an error-free, low-stress installation). Since installing EZ Flap is well within the skills of the average aircraft owner, there’s a good possibility your mechanic may allow you to do the work to reduce your costs. Q: Is there any permanent modification made to the airplane during installation? A: The only permanent modification is drilling two tiny holes in the end of the flap control locking button for the #6-32 screws. On Stinsons and some newer Cessna models (using the white plastic lock button), the button must be sanded or filed flat before drilling the two holes. Neither of these modifications prevents the original flap control from being used . The EZ Flap device can be installed and/or removed without any dis-assembly or de-rigging of the aircraft flap system. 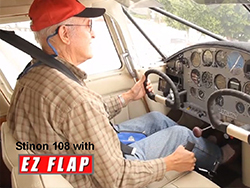 Q: Will it be difficult to use EZ Flap for the 30 and 40 degree positions in my Cessna? A: The EZ Flap handle can be used for all flap positions, however in Cessna aircraft the primary use is the 0, 10 and 20 degree positions. Due the Cessna's long lever and enormous movement arc, you will probably use the original Cessna flap handle for the 30 and 40 degree positions. On Piper, Maule, Stinson and Beech aircraft the EZ Flap will likely become the preferred control at all positions, however the original aircraft handle can be used at any time. Q: Why is the vertical tube at a slight angle, “leaning” to the left in some of the photos? A: The Cessna flap control lever is mounted slightly to the right of the aircraft centerline. However, the EZ Flap auxiliary handle needs to be on the centerline, between the seats so it moves equally between the two front seat occupants. 100% Money Back if you Don't Love It!